I’ve always been extremes: a worsted wool suit or denim jeans. But having had my first couple of “sports jackets” made I thought it was worth while moving up in the formality stakes with trousers occasionally. I realise up from jeans is chinos, moleskins, cords etc but when you start getting into fresco, flannel and gabardine I am totally at a loss as to their relative formality. I did have a quick look at flannel and fresco samples when last in my tailors and I personally wouldn’t be able to say which is more formal than the other – or are these two relatively equal and more a winter/ summer divide? A simple list, for a simple person like me, from formal to informal would be really useful. It’s a good question. We often look at the sliding scale of formality in regards to jackets and suits, or colours and patterns, but rarely trousers. There are certainly some materials that are more suited to summer or winter, but I would say we can safely combine them on the same list. Of course, this involves vast generalisations. We are essentially talking about three things – fibre, weave and finish – and some of the cloths listed above specify all of these, some of them only one. Particular finishes, as well as weight and construction, could quickly move a pair of trousers up or down the scale. Without even considering colour and pattern. But it remains a useful way to think about formality of dress. The further down the scale you go, the less likely the trousers will suit a smart navy blazer. The further up the scale, the smaller the chance they will go with your heavy Harris-tweed jacket. We could easily write a post on each cloth on the list. But hopefully this is the kind of simple list you were looking for Jack. Images. Top: fresco. Middle, cotton gabardine, linen, flannel. Bottom: woollen, denim, fresco. You can follow the discussion on The formality of trousers: Reader question by entering your email address in the box below. You will then receive an email every time a new comment is added. These will also contain a link to a page where you can stop the alerts, and remove all of your related data from the site. 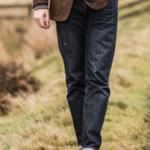 2) what trousers would you recommend to match a lightweight navy linen jacket? I assume linen on linen is a no no? 2) If it’s navy, the grey fresco might work? If it’s lighter, perhaps due to the linen itself, maybe try darker trousers. Anyone who you could recommend as doing good, heavy, RTW linen trousers? I currently have the following problem related to the article. I have a very light weight quarter lined mid blue odd jacket(SB, 3 patched pockets, spalla camicia shoulders) made from a silk/wool/(maybe +cotton and linen) mix, which has some of the silky glance. Until now I have worn it with red (a darker tone of red) jeans, but I want to order 1-2 pairs of trousers that would go with the jacket. Can you advise me which kinds of fabrics should I consider? my question was more in regard of the fabric than the colour. My concerns are if the fresco is the best option for silky jacket? Maybe you make a formality matrix. With cloth on one axis and cut and style on the other. A cube, with colour on the third axis? Do you favour worsted flannel or normal flannel? 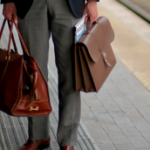 I particularly like the grey A&S pair you have with the slim leg and deep turn ups from the bespoke G&G post. Are these flannel or worsted flannel and do you wear them year round? What is the difference between standard cottons and chinos? Aren’t some very similar? Some chinos can seem quite formal, depends what you wear with them though I guess. It’s very vague. People call lots of things chinos. Generally, here we mean ready-made chinos, which will often be garment washed, giving them more of a worn-in look. That’s one reason they will never look the same as cotton trousers made bespoke. Hi Simon, as Hopsack is not dissimilar to Fresco would you rate Hopsack with a similar formality rating, though I’ve not seen trousers in Hopsack? I’d also welcome your considerations re. Fresco trousers (are they as light as linen but without the creasing?). Also, as it is a cloth I don’t often see, are the other makes of Fresco as good in weave and weight as the Hardy Minnis brand (company originators of Fresco). What are the “general woolens” and “general cottons”? I’m wearing cavalry twill trousers today, which I would put formality-wise around where you put general woolens, even though they are worsted and not woolen. Is that one of your “general woolens”? And is brushed cotton one of your “general cottons”? They’re both catch-alls, inevitably. There isn’t room to go into all the other weaves and finishes for cotton and wool trousers (of which cavalry twill is of course one, and brushed cotton the other). There’s a world of difference even in worsteds, as you highlight – from your twill to super-shiny Super-150s. Thanks. I would certainly place my cavalry twill below other worsteds, like plain weave, serge, prunella, and then below gabardine but above flannel and tweed. The difference in formality between some of these is so minute that it really doesn’t matter. Moleskin, corduroy and brushed cotton fit essentially the same role and are the same in formality. I agree that moleskin can be placed above corduroy, simply because it’s a smoother cloth, but it gets to the point where it doesn’t matter so much. Simon, another great and helpful post thank you. This just reminds me why I love Fresco, it is just so practical. Hard wearing, it doesn’t crease and can easily bridge formal to casual. I find with enough shades of colour in the threads it gets sufficient feeling of texture to be worn as a suit or separates. Just ideal for travelling. Worth trying both fresco and flannel. Heavier flannel won’t wear out that fast – and if you have a good tailor, you can get it repaired, even reforked. If you can try to make the jacket more casual too, for example by putting brown buttons on it if it doesn’t already have them. I can see the attraction of bright colours, but it’s risky and you already have enough to contend with in finding anything to go with the jackets! I have a navy blazer from Arthur & Fox. In the winter it is perfect with corduroy, either in bottle green or a purple close to navy. With the navy/purple corduroy I love the combination of the seemingly formal colour and informal texture. Blue shirt with some texture. Thank you for the informative post. As a follow up, what would you consider a summer alternative to flannel (on the scale of formality) for someone who wants to wear wool trousers all year. Is there such a thing? I was amazed to see that Holland and Sherry have procured Super 240s wool. Who buys this sort of material, and how long until the industry hits Super 300s?? Many thanks for posting my question. Are you aware of any RTW brands that sell Fresco trousers but ideally south of £200? Appreciate you wont have much personal experience at this lower level but I cant even find anyone to even look at their quality. Excellent post Simon; very useful and informative. Might it be possible to do a similar thing regarding shirts? I have an SB worsted navy jacket like you describe. In the winter I use it with narrow striped corduroy in bottle green or a purpleish navy. The latter in particular makes a nice contrast between formal colours and informal texture. Very versatile. Textured blue shirts. 1 – Flannel is made much more formal (as with many things) by being a stripe. A chalk stripe like you have had made is therefore pretty formal, yes, although perhaps still less so than worsted. I am having a fresco sports coat made (mid blue Hardy and Minnis 9 oz). Mr Hitchcock advised against having a liberty print lining due to the see thru nature of the fabric. Can’t quite see how this would work on trousers given the advise on the linings… I’ve defaulted to Super 120s/140s for summer wool trousers. Sounds interesting Sandeep. I agree on the lining. I would not normally have fresco as a sports coat – more a suit or trousers. But it does depend on the cloth a little. Essentially, how crisp and sharp it is. Fresco is normally quite crisp and takes a good crease, which is why it’s used for suits and trousers. I already own quite “dressy” chinos with hidden seams and higher rise. Quite similar to dress cotton trousers, but they lack the crease. So I need something smarter than chinos; cotton dress trousers are too informal, similar to my chinos. I might get a pair of cream cotton trousers but as I said they are quite similar to chinos. are fresco trousers available rtw? I like tropical wool trousers too, but they often lack any texture and can look like orphaned suit trousers. Linen trousers… I don’t know, difficult to find heavier linen trousers rtw. Before I was very pleased with howard yount but now with the euro/dollar almost 1/1 it’s not that convenient anymore. in winter you have flannell trousers which are dressy but casual at the same time. Not in summer… I will probably go with tropical wool trousers. I believe the “orphan trouser” is more of a problem on the internet or for the so called “igents”. It’s a problem with jacketing, a jacket is much easier to look like an orphan without more casual features. In trousers much less, especially if they are quite lightweight and light in color, like light gray trousers. You’re probably right Enzo, though a lot of suit trousers will still look too shiny and sharp to work with a jacket. You listed flannel as being pretty casual. Does colour have a bearing on this? Would a mid grey brushed flannel be less formal than a charcoal brushed flannel? Out of curiosity, which of the two colours would you go for to wear as stand alone trousers. Deep sigh of relief! I’d ordered the Fox Brothers mid grey flannel and was beginning to think that perhaps the charcoal might have been a better choice. As always, thanks for the response. What sort of jumper goes best with these trousers? Crew- or v-neck? Should colour be taking into account vis-a-vis formality? And what about the shoes? Ie. would a pair of dark mulberry/ red corduroy trousers (fine cord/ ”stripes”) go well with a dark navy crew neck jumper? Do corduroys with fine cords normally imply more informal shoes? Less formal trousers go with less formal shoes, yes. And cords aren’t very formal. Hi Simon. What’s your take on wool gabardine (9-10 oz) for a suit in the tropics? I seem to have picked up from the internet that it acquires a certain sheen over time and am confused as to if this is a desirable effect over time. Thanks ! Hi Simon, pardon the slew of questions but do trousers cut by the various houses differ vastly and if so, do they appear out of place when paired with another house’s jacket? For instance, would a jacket cut by Cifonelli paired with trousers made by say Huntsman or Dalcuore look out of place? I ask because I remember your piece on the various house styles where jackets were concerned and would like to know if this house style applies to trousers as well. — If this is one of your upcoming pieces then I apologise for jumping the gun. Thanks! 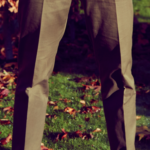 Would you be able to suggest a way of wearing corduroys without looking too “fogey”, especially for a younger man? What are your thoughts on fresco trousers with something like a field jacket? Do you think the cloth is too formal? Are there any wool fabrics you could suggest to go with such a jacket? Thanks. Is 10/11oz ok for summer.? To be honest, I’d never thought about flannel in summer. In my mind I’d always thought of flannel as a winter fabric. Ah, got you. Anything in wool that you could recommend for spring / summer. I’m not a fan of linen. Mostly just fresco and similar high twists. This could be tricky with a field jacket? Would a darker fresco cloth help? What about a cavalry wool twill? Could this work with a field jacket? I yearn for the days when things were simpler and a suit was the norm. Smart casual surely must be the bane of every man! In terms of formality, how would you rank wool cavalry twill? 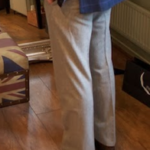 Can the trousers be a solid medium grey, or are they always striped? With regard to linen trousers, do the heavier weights still crease excessively? I’m thinking of getting a pair of trousers made up in a 13oz cloth. Will they require ironing after every wear? It depends what you mean by excessively. Heavier ones retain their shape a lot better, and soften after the first clean as well. For me, linen is most beautiful that first wear, and then about 10 wears in when it has wrinkled as much as it is going to. I take it you don’t iron the trousers after each wear? The creasing is both appealing and off putting. For me, it adds to its casualness but can also look scruffy if too creased. Are you familiar with Venetian weave fabric? If so, where does it sit on the formality scale? Not sure if this is the right thread to ask this but I have a pair of trousers that I’d like to add cuffs. My alternation tailor said there isn’t enough fabric to add them. However, he said he can add faux cuffs (french cuffs) to them. Do you have any reservations about doing this? Also, do you have a general rule of when you add turn-ups to trousers? Have you any experience of finemeresco fabric? I note you’ve had Crispaire trousers made previously. What weight were they? From what i can see, the high twist fabrics all come in around 9oz. My concern here is that it’s going to be see through. Thoughts? What weight were your crispaire trousers? Would you say, formality wise, crispaire and fresco are the same? I agree Stephen, you want something fairly timeless – though these things will always change, if only over a decade or so. 18 inches will be pretty wide. I’d recommend more like 17 or 16, unless your feet are particularly large. I am sorry to bother you on an old post. However, when I was at the Anderson and Sheppard haberdashery, I got really confused trying on a case pair of flat-fronted tab trousers. While looking at different trouser designs, the guy told me that flat-fronted trousers without cuffs are less formal than pleated trousers with cuffs. 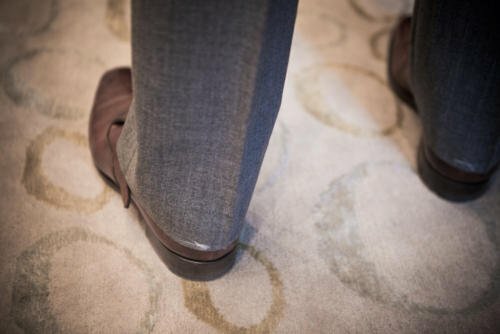 Do cuffs make a trouser more formal? Do pleats make a trouser more formal? Is there a rule when to have cuffs on your trousers? Thank you very much if you could elaborate on the subject. No worries Alex. It’s great when people add to the resource that is these older posts. Generally pleats are more formal than flat fronts, but not much. It’s just because they are something someone is more likely to notice, and associate with smarter tailoring. Cuffs are in theory more casual, as they break up the trouser leg and stop it having a clean, sharp line. On a suit I’d say they are always more casual. 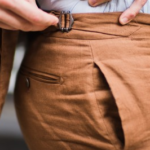 However, on chinos or more casual trousers, you could see why someone would consider them more formal, as they are something taken from tailoring. Hope that helps. Both are minor points so not worth worrying about too much. 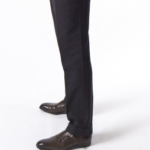 I have a pair of black rubinacci manny trousers and was wondering what colour blazer, other than grey, I could pair it with? And is there a combination that would be suitable in Spring / Summer. Black is a very hard colour to wear in menswear outside evening clothing, and not one most guys wear as a result. But it’s worth looking at grey, as you say, and olive. Plus some shades of tan/camel can look nice, but it’s hard to get the right one.